Fair Housing: It’s not an Option. It’s the Law! 2015 Savannah-Chatham County Fair Housing Council Poster Contest Fair Housing: It’s not an Option. It’s the Law! Coastal Middle and Hesse K-8, relating to this year’s theme: Fair Housing: It’s not an Option, It’s the Law! Posters were made in color on 11” x 17” paper and submitted to the Savannah Chatham County Fair Housing Council, Inc. in early spring. On April 10, a panel of Savannah Chatham Fair Housing Council board members and community leaders met to select the winning poster from each school. From these entries, three winning posters were selected: 1st Place – Grace Warmkessel, 7th Grade, Coastal Middle; 2nd Place- J’Mya Cutter, 8th Grade, Coastal Middle; 3rd Place -Naythaniel Jackson, 7th Grade, Hubert Middle. The overall winning poster entry received a Kindle Fire, second place received a one-hundred ($100) cashier’s check, and third place received a seventy-five ($75) cashier’s check. The City of Savannah is committed to provide leadership in fostering programs that educate and expose citizens to a rich and diverse range of cultural expressions, to support artistic programs. 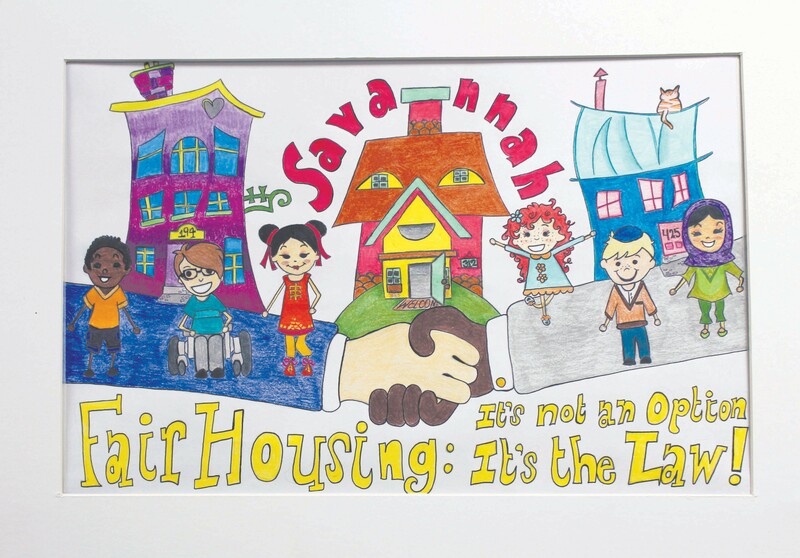 For a complete listing of the entries and winners of the 2015 Savannah-Chatham County Fair Housing Council Poster Contest visit www.savannahga. gov/arts.